The rate of technology change in today’s telecom networks is massive. And in our haste to deploy new 4G LTE and IP-based infrastructure we often forget that for every new technology we deploy, there’s typically a legacy network that’s been rendered obsolete and needs to be taken out of service. The irony is that operators have gotten good at rapidly deploying new technologies, but they’ve generally not taken the time to figure out the best ways to decommission legacy networks on a large scale. As a result, a small cadre of industry experts have emerged to help advise carriers and support the management of complex program investments in this vital area. One of the experts in Network Decommissioning is Dan Hays, the U.S. Wireless Services Advisory Leader at PwC. And in my discussion with Dan below, he explains the many complexities involved and strategies his firm uses to unwind decades-old legacy networks in an efficient and effective way. Dan Baker: To start off, Dan, I wonder if you could refresh us on PwC’s business and how you’re involved in the grand scheme of decommissioning things. Dan Hays: Sure, Dan. Well, PwC is currently the world’s largest professional services network and we have three primary lines of business. First, there’s what we call “assurance” and that’s our traditional accounting and audit capabilities. Second we help companies optimize their tax strategies and manage liabilities, and finally we have an “advisory” business that does consulting and that’s what I’m part of. We work with telecom clients on network decommissioning in many capacities. For instance, several of our clients have asked us to help them plan their network decommissioning strategy, assessing when, how, and how much it will cost them to actually execute it. We also lead and manage network decommissioning programs from start to finish, often with a focus on driving strong execution and lowering the overall cost of such programs. Operators generally don‘t have full-time staff expert at managing extremely complex programs to tear down their networks. Another thing we do is establish the logistics networks to collect decommissioned equipment, something called “reverse logistics supply chain”. Here we help the operator plan its asset disposition strategy: what they sell in the market versus what they move towards scrap, all with a mind to yield the largest residual value for their legacy infrastructure. We also work with our tax practice to optimize the tax benefits that operators realize when they are undertaking decommissioning efforts. Since most of this legacy equipment is being upgraded and replaced with a new generation of equipment, there are often tax savings opportunities at the state level when it comes to exchanging equipment. Similarly, we have folks in our practice who specialize in helping companies with their green policy — so here we make sure assets are being disposed of properly in terms of information security and that electronic waste is being disposed off responsibly and not being dumped in a lake or a field somewhere. So, that’s a quick end-to-end view of the things that PwC is doing in decommissioning. What are the major pain points for operators in network decom? PwC conducted a research study in 2012 that highlights many of the top concerns of operators in this area (see Figure below). The biggest concern operators often have is around costs — and that makes sense because unlike most other programs a network operators run, network decom is not about generating new revenue, so there’s a lot of pressure to minimize exposure. The second most-mentioned concern is that decom programs may interfere with ongoing operations. Telecoms don‘t want this one-time major activity to reduce their ability to serve customers. Whenever you turn off a network to decommission it, there’s a long tail of customers affected. Enterprises are the toughest to transition because they have large volumes of users and mission critical applications that are running on a legacy network. And transitioning an enterprise is not as simple as flipping a switch. It often requires complex verifications and testing that can stretch over many months. For example, in the case of one of our clients with a legacy network, the last customer who will be shut off on that legacy network is going to be a set of nuclear power plants. As you can imagine those plants run mission critical communications over those networks and they don‘t make changes without an awful lot of testing. In the mobile space, many campuses, malls, and companies with large buildings have deployed in-building systems to improve coverage and capacity. Those in-building systems serve specific audiences who are often under separate contracts with landlords and enterprise customers. Every one of those has to be renegotiated and hopefully upgraded separately so the operator doesn‘t lose the customer. This issue is a big deal for many of our clients. And the third most cited concern is around planning these programs. Decommissioning is a very complicated program that can involve thousands of landlords and dozens — if not hundreds — of subcontractors who are doing the physical work. When you add to the complexities of doing the reverse logistics, and coordinating with potential buyers of the equipment who are purchasing the released assets on the other end, you begin to see how big and risky decommissioning programs really are. Besides securing potentially significant tax benefits, operators also need to manage the resale value of the equipment, and considerable logistics cost incurred in decommissioning. When you combine all these things, many operators struggle to put together a comprehensive program on their own, especially since they don‘t specialize in it. The tax breaks alone are an opportunity that operators often miss. Dan, thanks for this very interesting briefing. As a final thought, I’m wondering what your research tells you about how decommissioning differs across mobile and wireline service providers? 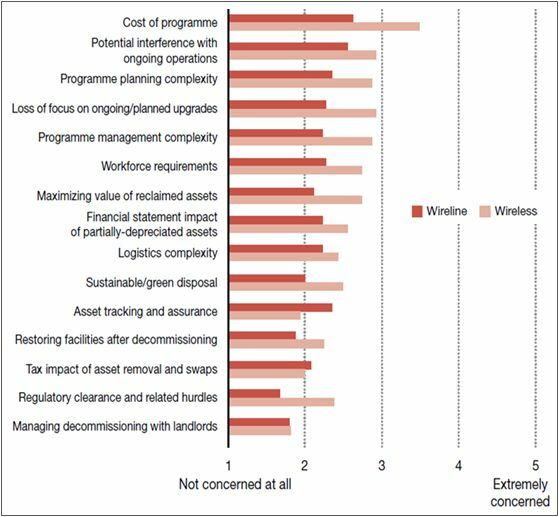 The data seems to suggest that wireline operators are slightly ahead of the wireless industry in planning for decommissioning. We found that about three quarters of wireline network operators have begun to plan for network decommissioning while only half of wireless operators have done the same. Of course, the challenges are quite different across these markets. In mobile, the assets are widely distributed at cell sites and switches, but they are relatively easy to get at: they are in buildings or shelters, and at the worst, they are on top of towers. Wireline operators, face even greater challenges because much of their legacy assets in outside plant are buried in the ground or strung on poles. That’s expensive and hard to get at. So there are considerations on both sides as to what assets are worth recovering versus those that you probably should abandon. In many cases, that decision revolves largely around logistics costs: how much will it cost to deconstruct or even dig stuff up and ship it somewhere versus the amount of money that may be recoverable and the risks and liabilities that are incurred in abandoning infrastructure. PwC has prepared a fine research paper for download entitled: Clearing the way: 2012 Outlook for telecom network decommissioning. The paper reports the results of a study PwC conducted in 2012 and highlights the drivers, plans, readiness, and key concerns associated with network decommissioning.